Summary: This project will compare the physiology and swimming behavior of hatchlings emerging from nourished beaches to those emerging from native beaches. Data show that nests laid in nourished beaches with high sand compactness and high sand calcium carbonate, are subjected to incubation conditions that can negatively impact hatchling physiology. Nourished beach hatchlings had relatively smaller body depth, were more dehydrated, had lower blood glucose, higher blood lactic acid, and crawled slower than native beach hatchlings. This experiment will monitor the incubation of loggerhead sea turtle eggs in nourished and native beach sands. After hatching, a subset of emerging hatchlings will undergo a physical evaluation that includes blood analyses to document baseline physiological differences derived from the beach environment. A second subset of hatchlings will be placed in a circular pool and their behavior and swimming speed monitored for 24- hours. By comparing how native and nourished beach hatchlings behave during their swimming frenzy, it will give us an indication of their ability to swim away from their natal beach and reach offshore waters. 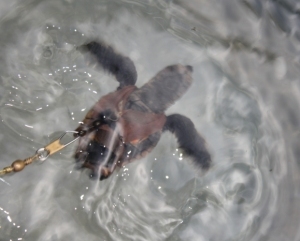 Differences in hatchling swimming fitness will be analyzed based on their physiology and incubation conditions. These will be correlated to different beach nourishment practices such as sand CaCO3 concentrations, sand compactness and beach tilling. Knowledge of how sand physical properties can impact hatchling survivorship will help State regulators determine the best practices for beach nourishment and protect the future of this species. Results: The first part of this project was accomplished with the collaboration of the UCF Marine Turtle Research Group. With their assistance, three loggerhead sea turtle nests were used as a source of 120 eggs that were randomly assigned to three experimental incubators. Incubators were buried on the beach and filled with sand with relatively high total calcium carbonate (10-12 %), a value based on the average measured from Florida nourished beaches. The second part of this project conducted a physiological assessment, designed in collaboration with the Veterinary College at the University of Florida, of hatchlings emerging from experimental incubators and control nests. Hatchlings from incubators with high sand carbonate (n=30) and native beach control nests (n=30) were placed in a circular pool and their swimming activity recorded for one hour. Data were collected for number of breaths, long breaths, time floating/resting as well as number of swimming strokes and swimming force exerted. Results show statistically significant differences (p< 0.05) in body weight, width and length between hatchlings emerging from incubators with high carbonate sand (smaller hatchlings) and those from beach nests in native sand. Swimming trial results indicate that hatchlings emerging from nests with high sand carbonate (and consequently high CO2 levels), require more time to disperse away from the beach when compared to hatchlings from control nests.